Updated at 12:25 PM, 10/06: Posting updated launch-to-docking timeline. 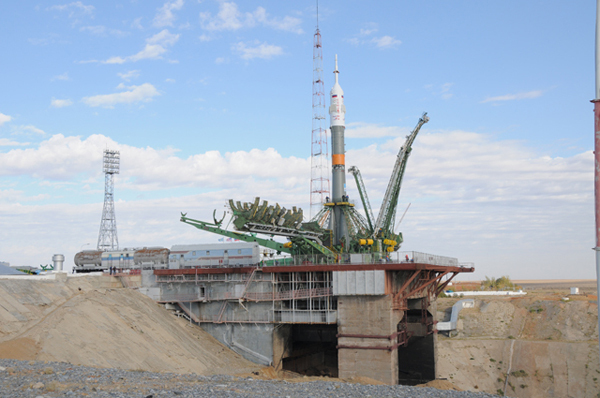 Veteran shuttle commander Scott Kelly, Alexander Kaleri and Oleg Skripochka are preparing for blastoff to the International Space Station Thursday evening (U.S. time) from the Baikonur Cosmodrome in Kazakhstan. 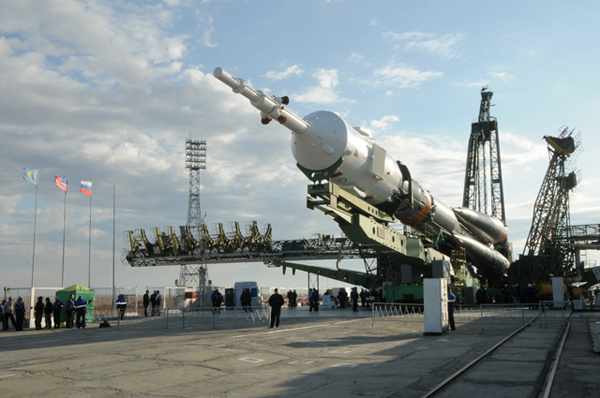 Liftoff aboard the upgraded Soyuz TMA-01M spacecraft is targeted for 7:10:55 p.m. EDT (23:10:55 GMT) Thursday. 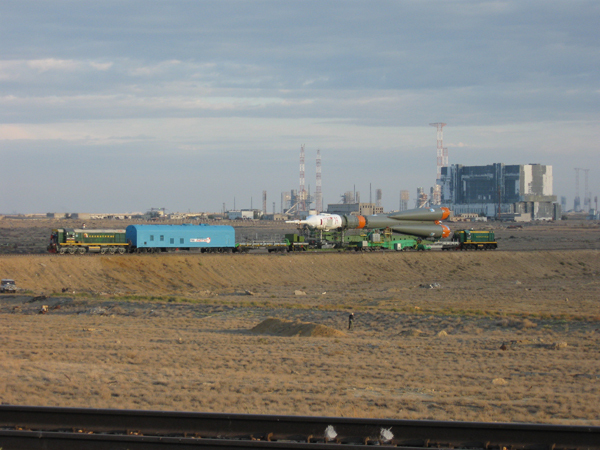 The Soyuz rocket was rolled to the launch pad Tuesday. All three crew members will participate in a traditional pre-launch news conference that will be replayed on NASA television Wednesday. "It's a pretty reliable system," Kelly said of the venerable Russian rocket. 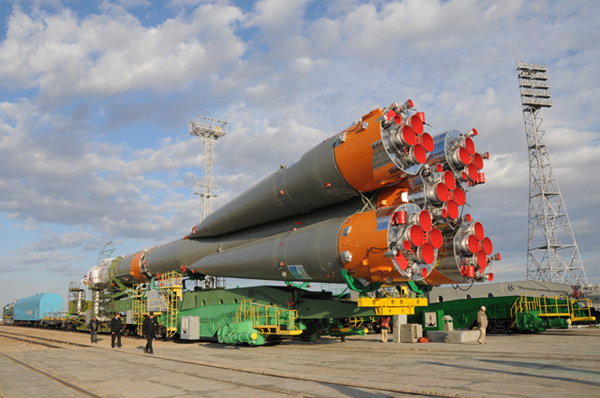 "The Russians have been flying it since the 1960s, I think my flight will be the 107th flight of the Soyuz system. We're really fortunate to have this partnership where we can change launch vehicles and not have our own access to space while we still utilize our space station." Assuming an on-time liftoff, the Soyuz TMA-01M spacecraft will dock at the upward-facing Poisk compartment atop the space station's Russian Zvezda command module around 8:02 p.m. Saturday (00:02 GMT Sunday). A countdown and launch-to-docking timeline is posted below. Kelly, Kaleri and Skripochka will join Expedition 25 commander Douglas Wheelock, Shannon Walker and Fyodor Yurchikhin, who have had the station to themselves since the departure of three other crew members Sept. 25. 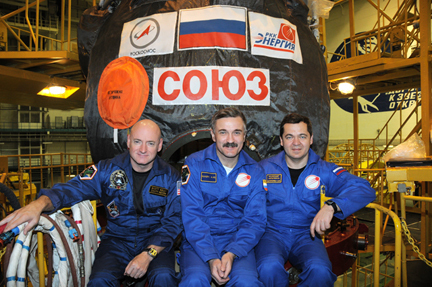 In turn, Wheelock, Walker and Yurchikhin are scheduled to return to Earth Nov. 30. With Wheelock's departure, Kelly will take over as commander of Expedition 26 with three fresh crew members scheduled to arrive in mid December. "When we first started training for this, I thought it was going to be sort of like a lot of the ISS missions we've had where you had potentially long periods of time between visiting vehicles," Kelly said. "But as our flight turns out, it's starting to look much more like a five-month shuttle mission than a long-duration mission." Kelly's crew will oversee two space shuttle visits, one in November and the other in February, a Soyuz departure and arrival and dockings by four unmanned cargo ships launched by Russia, Japan and the European Space Agency. In addition, three Russian spacewalks are planned. "We're finishing up assembly of the space station and it's really time to start ramping up the science we're going to do on board," Kelly said. "We hope to average about 30 hours a week of crew time for dedicated ISS science."